An educationist who came to live in Mylapore is being remembered by his family on his birth centenary. 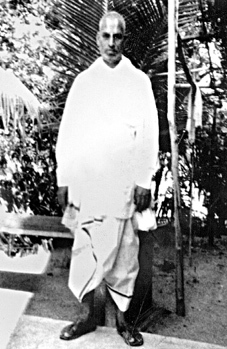 T. Ramanujachary, Manager and Correspondent of Sri Hindu Bala Patasala, Higher Elementary School, Chepauk-Triplicane, lived in Mylapore for over thirty years. And his family remembers him for his contribution to education, especially of the poor in the Triplicane-Chepauk area of the city. He was born in 1905 in the village of Tirukkoilur to a Vaishnavite family. The family circumstance was such that the parents never thought that their newborn baby would one day make himself a man of some credit and standing. The boy lost his father at the very early age of nine. He was brought up by his mother. Though poor he was, he had the will to come up in life in doing something useful to his society. This will of his to succeed in life stemmed out of an incident in his life. When he was in his early days of trying to make a living, one day he had to perform the annual rites of his father. He did not have money and had to ask one of his seniors to lend money. The senior told him that if he could not have money to perform his fatherÕs annual rites, then it meant that he was not fit to make a living. It was from that day that this man resolved that he would start saving and building for the future so that he did not have to go to anybody for the bare minimum requirements in life. He had his education at the then famous T. T. V. High School, Mint Street, Chennai (Madras). He stopped his education with IV form and joined the Higher Grade TeachersÕ Training at Madras. He then secured a teacherÕs job in a pial (Thinnai Pallikudam) school in Chepauk. He managed two schools at the same time. Gradually he acquired the friendship of the then eminent educationists, A. Ramaiah Chetty, Ramanujulu Naidu, N. K. Thirumalachari and Veeraraghavan of Aramba Kalvi. He got recognition for the pial school and gradually converted it into a higher Elementary School. In 1934, he bought the school where he served as a teacher. The school grew but there was a dark period during the war time. In the early forties, Ramanujachary shifted the school to a big house in Mosque Street, Chepauk. The school was at its height for three decades under the able headmasterships of N. Rajaratinam, A. V. Ramasarma, T. D. Vimala, T. R. S. Raghavan (his only son) and Aravamudha Iyengar. The school produced good results at the E. S. L. C. Public Examination and was applauded by the Education department. A good many artists, musicians and others were the products of his school. The School existed for about sixty years (1922 - 1983). He moved to Mylapore in 1955 after constructing a house of his own in the plot purchased at Plot No. 97 (New No. 4), Sixth Cross Street, C. I. T. Colony, where his son and grandchildren reside now. Just before his death, he said that he started the school with the intention of giving education to the poor and the needy. But owing to the changes in the educational policy of the Government, he could not continue his service to the cause of education as he desired. His health deteriorated and he passed away in 1983. Family and relatives have been associated with the school and its activities. They include W. R. Aravamudhan (retd. Chief Manager, IOB, Chennai), who worked in the school for a few months, M. D. Kannan (retd. Senior Audit Officer, A. GÕs Office), W.R. Varadarajan of Communist Party of India, W. K.Vijayaraghavan (Senior Divisional Manager, National Insurance, Mysore), P. V. Narayanan (Consultant, Bangalore), P. V. Jegannathan (Senior Audit Officer, A. G.s Office), his grandson T.S.T. Ramanujam (C. F. O., Serviont), grand daughter Usha Vijayaraghavan and Sheela Ramanujam. The photo of Shri Ramanujachary brings back my childhood memories of sixties. My house we just opposite Hindu Bala Pada Sala and i have seen him sit behind a desk just near the entrance of the school. Despite severe handicaps he ran the school successfully for many years. On weekends i remember weddings were conducted in this school possibly to generate extra cash to run the school.